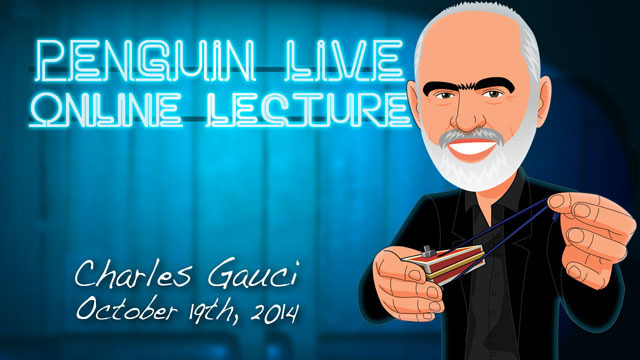 Today, when you order "Charles Gauci LIVE", you'll instantly be emailed a Penguin Magic gift certificate. You can spend it on anything you like at Penguin, just like cash. Just complete your order as normal, and within seconds you'll get an email with your gift certificate. Charles Gauci LIVE (Penguin LIVE) The Wow Factor: Creating maximum effect with as little effort as possible.SUPPORT LIVE MAGIC. DOWNLOAD THE FULL LECTURE TODAY. Intuition: Paul Curry’s “Out of This World” is regarded as one of the greatest card effects ever. I believe that my Intuition goes one step further. No sleight of hand, self-working. Close up effect. Super Memory: I close my professional routine with this effect. The performer recalls an entire genuinely shuffled deck of cards. No memory required. Suitable for close up or stage. The Die is Cast: An impossible prediction effect of three cards from a deck that has been shuffled by a spectator. Self-working. Perform within three minutes of watching the video. Astral Projection: Use your own cell phone to name a card that has been selected from a shuffled deck. Even the spectator does not know the card that he has stuck a sticker on. Can also be performed with an assistant on the phone who is miles away. Again very simple when you know how. Completely free selection of a card from a shuffled deck. No force required. Self-working. No coding. Power of the Mind: I have performed this in a theatre for up to one thousand people. A complete 10 minute memory routine which will convince the audience that you have a super mind. A Card at any Number: One of my four versions of this classic effect. Suitable for stage or small audiences. 15 Minutes No Mnemonic Card Memory System: Easy to learn and you will be performing some miracle effects using this system. Charles Gauci is recognized by his peers as one of the most creative minds in magic. 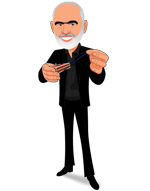 Charles has created a number of original effects which have become best sellers all over the world, including: Eye To Eye, Body Language, Diabolical Wallet, It Must Be Mind Reading, Nostradamus and The Houdini Card Mystery... just to name a few. Charles was born in Hamrun, Malta, in 1937, and immigrated to Australia in 1949. In 1950, he became fascinated with hypnosis after witnessing a demonstration by the great Franquin. In 1951, Charles joined The Australian Society Of Magicians, and turned "pro" at the age of only 16! His first professional performance consisted of fire-eating, bullet catching and sleeping on a bed of nails! Charles then went on to tour with Peter Reveen, and for the next 27 years he performed all over Australia appearing on every major television show. In 1977, after performing for 27 years, seven nights per week, Charles decided that maybe his work in the magical arts was over. However, in 1994, while he and his wife, Kathryn, were on holiday, he was asked to perform at an opening of an art gallery on the French Riviera. The response from the show was so good that he once again experienced the high that comes with performing, making people happy, and the art of magic. Charles believes that good magic is simple magic. Part of his genius is in his inherent ability to simplify those things that are not supposed to be simplified. His philosophy is to create maximum effect with as little effort as possible. He prefers to place emphasis on presentation instead of worrying about executing a difficult sleight correctly. In 2010 he was presented with the Dave Lederman memorial Award for "Creativity in Mentalism" at the prestigious Psychic Entertainers Convention. If you've never been to a magic lecture, theres never been a better time. Sunday October 19th at 7:00pm, we're live-streaming Charles Gauci LIVE in a spectacular 2-hour interactive online lecture. Watch, ask questions and learn things you won't find in any book or DVD. 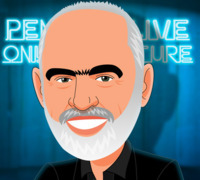 Purchase the Charles Gauci LIVE product. This is your ticket. On Sunday October 19th, anytime before 7:00pm Eastern, click the MyPenguinMagic area at the top of the Penguin site. You'll see the livestream appear 1 hour before showtime. At 7pm sharp, Charles will hit the stage and begin his JAM-PACKED professional lecture. Ask Charles questions and discuss the tricks DURING the lecture. Mistake after mistake, and slow-paced making it more painful than sitting on a wasps' nest. Charles Gaucci is a seasoned mentalist and there is little doubt you will get something you can use out of this lecture. Yes, a few of his effects didn't go as planed. However, the man is 77 years old and was suffering from jet lag. His explanations more than made up for the few glitches. You also get a pdf that explains most of the effects he performed. His philosophy deserves consideration. He emphasizes having a relatively small set of highly effective tricks that you are able to present well over quantity. It is hard to argue with that philosophy. For the right occasion, I will probably use the magic square effect. He memory demonstrations were interesting, but I prefer Bob Cassidy's method, but it is also good to see other methods. It is definitely worth the $29.95. Any Card any Number ,The magic square year devination ,Free will,and when the performer and spectators cards matched were among my favorites ! This is a performer That I have not been able to see ever !I saw him at a convention with Larry Becker and Lee Earle at a table .I knew he was good ...and I saw it all on Penguin Live !! Charles had bad day that day and he made few mistakes. Still great mental effects without any sleight of hand! Oh dear. Much of the stuff went wrong and he kept blaming tiredness and jet lag for the mistakes. No excuse really. I really liked Charles. Ya he had a mistake or two but in mentalism it's better to have an error, you look more human and if it wasn't a lecture for magicians I'm sure he would have a clean up if he felt he had to... Anyway some great effects and his version of the magic square is the best I've seen, his version makes a lot more sense and using big numbers are killer to a layman. All his material was top notch!